Never mind 127 hours, this film does it in 72. Actually, it doesn’t. Most of the action in The Next Three Days – whose underwhelmingly generic title seems almost designed to induce indifference and prevent you from going in to see it – actually takes place before the three days in question, but hey. (It’s funny to hear people asking at the box office for “a ticket for the next three days, please.”) It’s the fast-turnaround Hollywood remake of a well-liked French directorial debut from 2008, Anything For Her or Pour elle, which is a better title either way. I didn’t see it, but I know it was about an ordinary, mild-mannered geography teacher who has to break his wife out of prison after she is wrongly convicted of murder. The American remake, written and directed by Paul Haggis, seems to be pretty much identical. Except Russell Crowe is an ordinary, mild-mannered English teacher, which gives him the opportunity to be shown teaching a class about Don Quixote and Haggis the opportunity to make some comparison between what he has to do and what Cervantes’ hero had to do, although to be honest, I’ve forgotten what profound thing this was. It’s a pretty good thriller, actually, the sort that would work just as well when it turns up on telly, and which strives for Hitchcockian, as they all do, and never quite gets there. I haven’t seen the original, so I’ll take it on trust that it’s virtually identical, because I’ve read that it is; except it’s about 30 minutes longer. Why? What has Haggis added, or stretched out? I don’t know. But it seems a little self-indulgent, or flabby, to fail to wrap up the same film in roughly the same running time. Maybe the big stars like to be on screen for longer? Maybe a 122-minute film feels more important than a 96-minute one? All credit to Fred Cavayé, who wrote the French original: the essentially preposterous prison breakout plot unfolds with enough inconvenient setbacks to counter its convenient jackpots, and you won’t see Crowe’s Neeson-predicted Eureka moment coming (unless you saw the original, in which case, you will see it coming). No more plot details. Don’t want to spoil your fun. Paul Haggis is a capable action director, although is that really what he’s for? There’s a lot of air blowing through this one compared to the issue-heavy films he’s directed previously (Crash: racism comes in many forms; In The Valley Of Elah: war, what is it good for? + you can’t trust the US military to solve its own crimes). I guess we shouldn’t complain about that. It’s a functioning thriller, not a polemic. Also, some dislike Haggis’s finger-wagging. 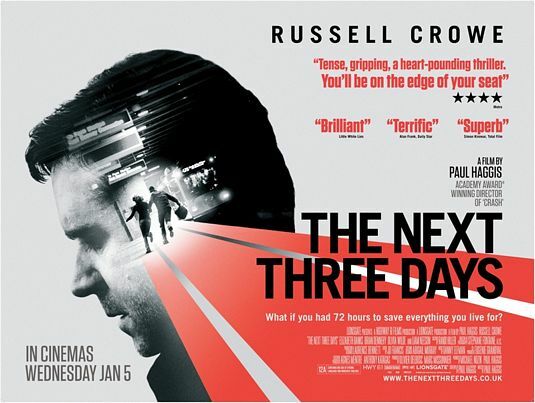 There is none of that here, just Russell Crowe running, driving, writing things on a map, trying not to get beaten to a pulp by Pittsburgh’s shady underworld characters while he attempts to buy false passports and successfully keeping his young son onside until those “next three days” kick in. Unlike 127 Hours, I do not urge you to go and see it. I like to save up my urging. Although I enjoyed it.